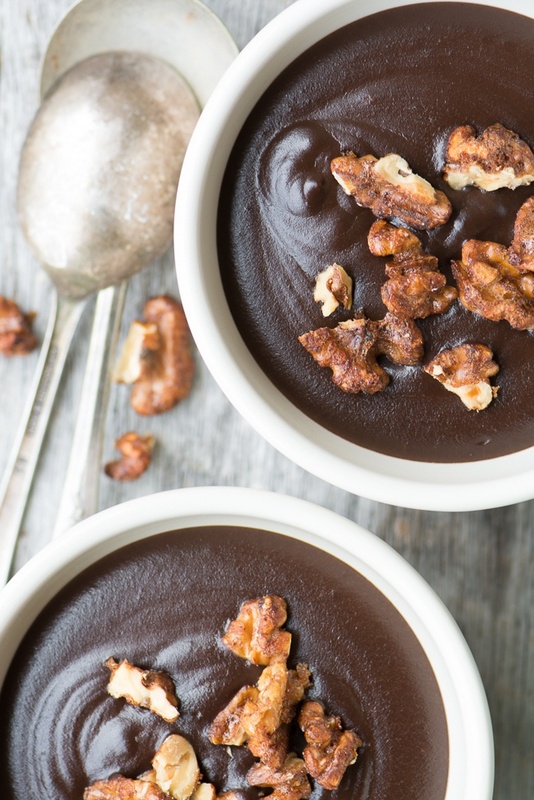 Warm Chocolate Pudding with Chili Spiced Walnuts...take your first silky, indulgent spoonful and let the endorphins flow! Whisk the egg white until frothy. Whisk in the sugar and chili powder. Add the walnuts and stir to coat them completely. Spread out the walnuts in a single layer on a parchment or silpat lined baking sheet. Bake until they are toasted and dry, about 25 minutes, tossing them around every 10 minutes or so. Set aside to cool, then give them a rough chop. Put the milk and butter in a heavy saucepan and bring up to a simmer. Meanwhile whisk the eggs, sugar, cornstarch, salt and cocoa powder in a heatproof bowl. Just as the milk comes to a simmer, take it off the heat and drizzle about a cup of the hot milk into the egg mixture, whisking the entire time. Then pour the egg mixture back into the saucepan and put back on the heat. Heat, while stirring constantly, until the pudding thickens and just comes to a boil. Take off the heat and whisk in the chopped chocolate and the vanilla extract, whisk or stir until it is smooth and all the chocolate has melted. Pour the pudding through a mesh strainer and then fill your serving bowls. Top with the chili spiced walnuts and serve warm.